Egg. The clear part is the egg white. The yellow part is the egg yolk. 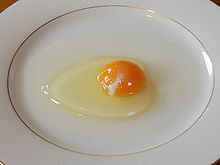 The egg white, also known as albumen, is the clear liquid part of the egg. The yellow part is called the egg yolk. The egg white holds the egg yolk in place. Most of the egg white is water. It is low in calories. They are high in protein. They can be whipped into a foam. The egg white foam is used to make many things like mousse and meringue. They are also used in baking. It is rich source of protein without high calorie or fat/cholesterol intake. This page was last changed on 4 March 2015, at 18:59.